Exquisite instrumental wedding music. Live performances of timeless ceremonial favorites. This wedding CD is unlike any other. Our intent is to provide couples with a solid foundation when choosing a wedding ensemble and ceremony music. Your time is valuable, so endless Internet searches and multiple CD purchases are probably not an option. This musical presentation will allow you to hear many different wedding ceremony ensembles on one collection. Most of these types of groups will likely be available wherever you reside. 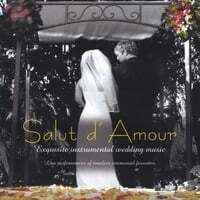 Salut d' Amour was recorded in an acoustically rich and vibrant sanctuary by sixteen outstanding musicians who are prominent members of the classical music community in Austin, Texas. The musical selections were performed as you would hear them on your wedding day, without editing or falsifying the true sound achieved during a live performance. Each piece performed on this recording is listed with a description of the music and helpful information about where to use each selection in your wedding ceremony. Over the course of the CD you will hear a variety of string ensembles in addition to classical guitar, organ, trumpet, harp, flute, piano, brass quintet and voice. If you purchased this CD with the hopes of finding some guidance, we believe you will discover music which perfectly fits your style and information which answers most of your questions. This CD was produced by Carolyn Hagler, founder and director of the Barton Strings, a very popular string ensemble in Austin, TX. Carolyn has performed in over 800 weddings and brings her training and insight to this recording. We hope you enjoy this musical journey! This is a wonderful CD. It shows what wedding artists are capable of in an unedited performance. Lots of different artists. It's great to be able to hear so many different groups on one CD. I listen to it around the house because it is so beautiful.